The Joye510 Starter Kit is one of the easiest electronic starter kits to begin your electronic cigarette smoking experience. A great kit to purchase for yourself or as a gift for someone you know. 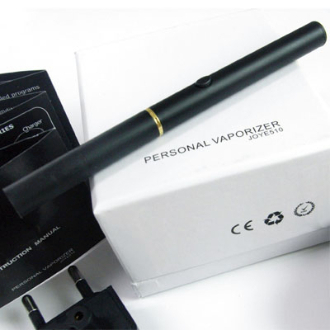 The manual batteries give the smoker the ability to control how much nicotine and vapor they are inhaling. The more vapor you enjoy, the longer you hold the button down. When you are done inhaling, release the button. Joye 510 Starter Kits come in many color options, which include: black, white, silver, pink, gold, metallic green, metallic red, and metallic blue. NOTE:Joye 510 batteries have a 180mAh capacity. They will need to be charged throughout the day after using them for a few hours. The initial charge must be for 8 hours. When recharging your batteries, only do so for 2 to 3 hours maximum.